When Othello was performed on December 8, 1660, the audience saw something startling—a woman acting the role of Desdemona. Until then, including in Shakespeare’s time about half a century earlier, the roles on the professional stage in England were played by men, with young men or boys acting the female parts. Casting a woman was quite new. A Woman to my knowledge . . .
Wee doe . . . permit and give leave That all the woemens part to be acted in either of the said two Companies for the time to come maie be performed by woemen, soe long as their Recreations . . . may by such Reformation be esteemed not onely harmless delight but usefull and instructive to Representations of humane life. Women actors were there to stay, but what did that mean, and who were they? While women were new to the professional theater in 1660, they had, in fact, performed earlier in England in different circumstances. Women were involved in the religious and craft guilds that sponsored the medieval mystery plays and may have performed in them as well. 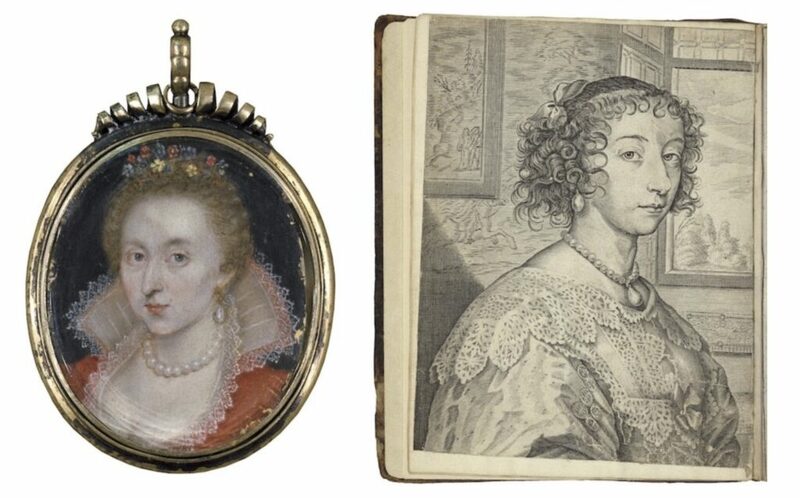 It is well-known that court ladies, led by queens Anne and Henrietta Maria at the courts of James I and Charles I respectively, often performed in elaborate masques, and throughout the 17th century, women participated in household performances of plays. At left: Anne of Denmark. Miniature, circa 1620? At right: Henrietta Maria. Frontispiece, The exemplary lives and memorable acts. 1640. Folger Shakespeare Library. Public theaters, officially closed in 1642 under Cromwell, were revived after the restoration of Charles II in 1660. Charles and the royalists who had been living in exile in France were familiar with women performing on stage in Europe, so it made sense to allow them back home. Playbill, 1697. Folger Shakespeare Library. 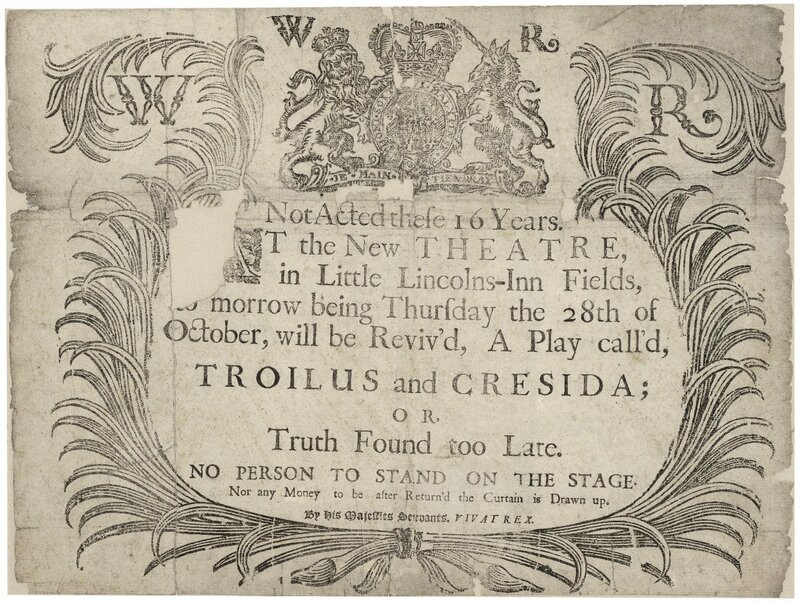 This playbill, one of the earliest to survive, advertises a production in 1697 of Troilus and Cressida in Dryden’s adaptation. Although there is no cast list, we know that the play was performed at Lincoln’s Inn Theatre by Thomas Betterton’s company, which included 13 actresses. Who were these early actresses? 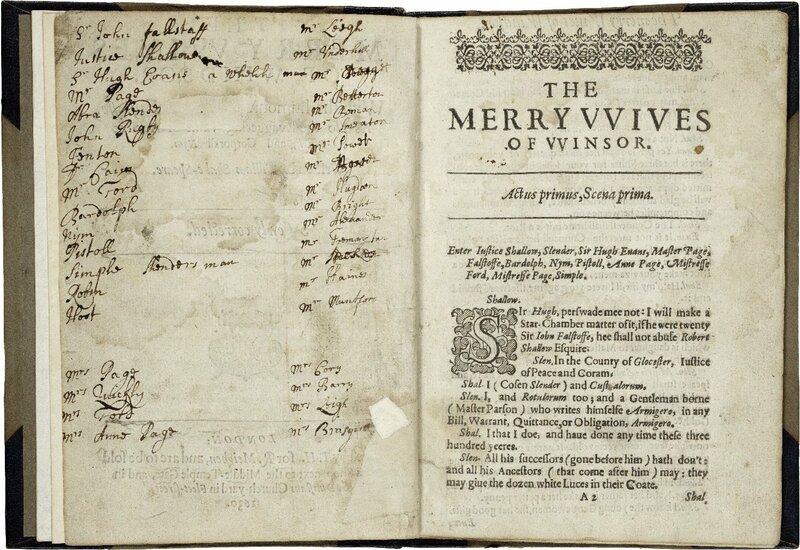 The names of some of them are written into a copy of The Merry Wives of Windsor at the Folger. Although printed in 1630, the book was owned by someone in the late 17th century who added a cast list for a performance of the play which dates from that period. It shows Mistress Page played by Mrs. Cory [Corey], Mistress Quickly by Mrs. Barry, Mistress Ford by Mrs. Leigh, and Anne Page by Mrs. Brasgird [Bracegirdle]. The Merry Wives of Windsor. 1630. Folger Shakespeare Library. The humorous housekeeper, Mistress Quickly, was played by one of the greatest actresses of the period, Elizabeth Barry (?1658–1713). 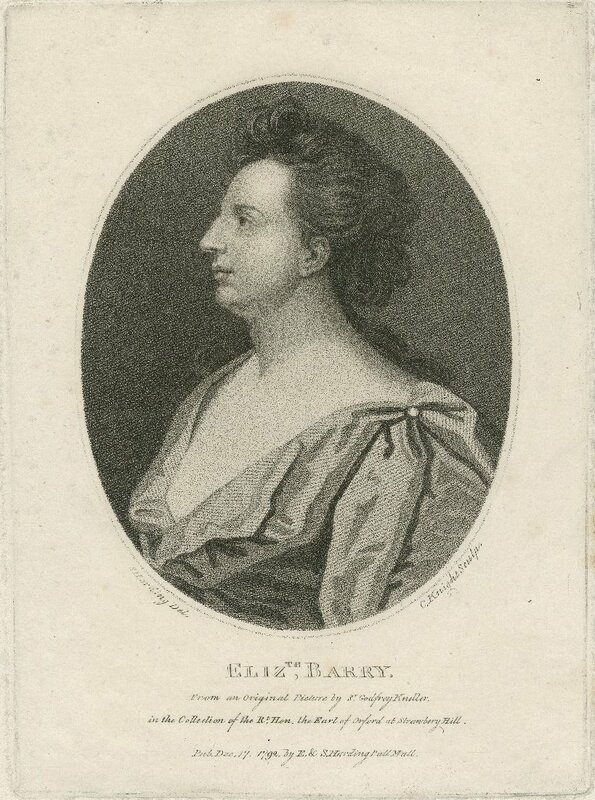 Elizabeth Barry. From an original picture by Godfrey Kneller. Print, 1792. Folger Shakespeare Library. Because Barry excelled in heroic roles such as Dryden’s Cleopatra and Shakespeare’s Lady Macbeth, Mistress Quickly seems a little out of her usual range. She helped one of the first female playwrights, Delarivier Manley, make a success of her play The Royal Mischief. Manley wrote: “my Obligations to her were the greater, since against her own approbation, she excell’d and made the part of an ill Woman, not only entertaining, but admirable.” Mrs. Barry was one of the highest paid actresses and she was the first to have an annual benefit granted under James II. 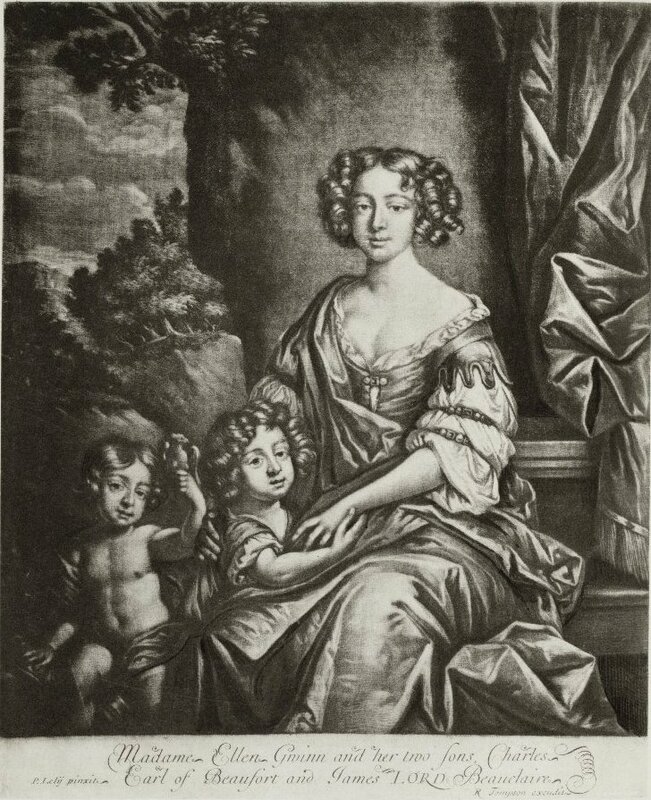 Another great actress, Anne Bracegirdle (circa 1663–1748) played the ingenue role of Anne Page. She was the youngest of these four actresses, and Cibber describes her as being a favorite with audiences. Though many had crushes on her because of her “Youth and lively Aspect,” Cibber writes that she maintained discretion and did not succumb to flattery. Her many roles included Desdemona in Othello and Ophelia in Hamlet, but she was especially charming in comedy. 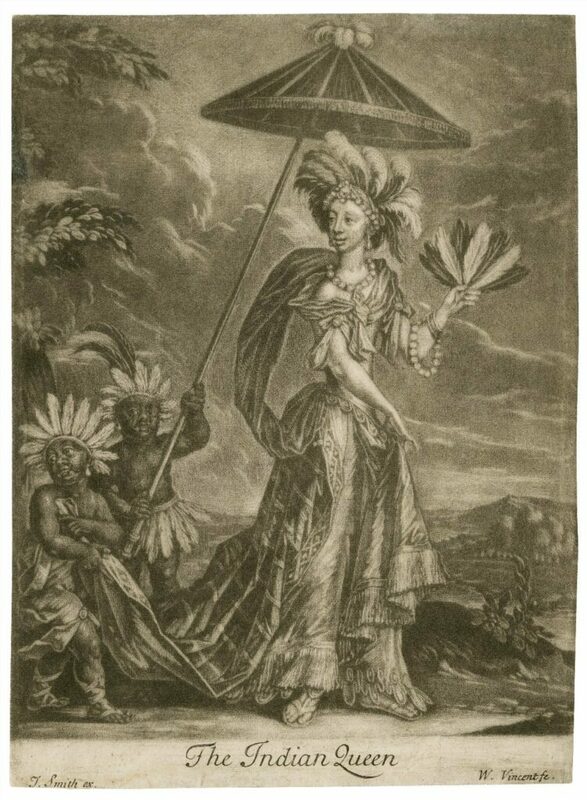 In addition, she performed Semernia, an Indian queen, in Aphra Behn’s play The Widow Ranter, set in the new colony of Virginia. Anne Bracegirdle as Semernia. William Vincent, The Indian Queen. Folger Shakespeare Library. Together, these actresses and many other women were pioneers in shaping the female roles of playwrights such as Shakespeare, Dryden, Congreve, Behn, and Manley for the English stage. Nell Gwyn. Print, by R. Tomson after Peter Lely, from Peter Cunningham, The story of Nell Gwyn. 1883. Folger Shakespeare Library. Nell Gwyn, who was also the mistress of Charles II, was an early English actress, too. Although not known for performing Shakespearean roles, she enjoyed attending his plays and saw The Tempest four times within four months in 1674. Join us for the play Nell Gwynn at the Folger to learn more about her story and this fascinating period of English theater. Beauclerk, Charles. Nell Gwyn. London: Pan Books/Macmillan, 2005. Bush-Bailey, Gilli. Treading the Bawds: Actresses and Playwrights on the late-Stuart Stage. Manchester; New York: Manchester University Press, 2006. Highfill, Philip, et al. Biographical Dictionary of Actors, Actresses . . . in London, 1660–1800, 16 vols. Carbondale: Southern Illinois University Press, 1973-1993. Howe, Elizabeth. The First English Actresses. Cambridge: Cambridge University Press, 1992. Marsden, Jean I. Fatal Desire: Women, Sexuality, and the English Stage, 1660–1720. Ithaca, NY: Cornell University Press, 2006. Ritchie, Fiona, “Shakespeare and the Eighteenth-Century Actress,” Borrowers and Lenders: The Journal of Shakespeare and Appropriation, 2 (2006). Georgianna Ziegler is the Associate Librarian and Head of Reference Emerita at the Folger. She has curated several exhibitions on Shakespeare, including "Shakespeare’s Unruly Women" and "America’s Shakespeare," and is a past president of the Shakespeare Society of America.